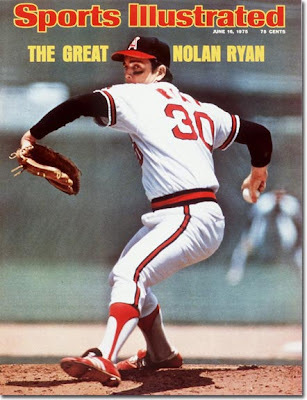 In 1970 Nolan Ryan's first start came on Saturday April 18th at Shea Stadium, in a match up against the Philadelphia Phillies. It was one of his best regular season performances in a Met uniform. After allowing a leadoff single to infielder Denny Doyle, Ryan never gave up another hit. He did walk six batters, but threw a one hit shutout, striking out fifteen batters in a 7-0 win. In his next start he was almost as good, but allowed one run, (just two hits) over eight innings, but took a 1-0 loss at Dodger Stadium, to Claude Osteen. On April 30th in San Francisco, he pitched a three hitter, allowing just one run to beat the Giants & Mike McCormick in another squeaker; 2-1. In his first three games of 1970 he was 2-1, had only allowed two earned runs (0.69 ERA) & struck out twenty eight batters in 26 innings of work. In May he took two straight losses where he was hit hard, first for four runs then for seven runs. On May 24th he pitched another gem, this time a two hit eight strikeout performance against the Chicago Cubs at Shea Stadium. But Ryan's inconsistency haunted him again as walks & a lot of earned runs had him at 6-6 by August. He then had a terrible August going 1-4 allowing twelve earned runs in thirty innings. He even blew a save that month, giving up a 9th inning two run double to the Reds Johnny Bench. Ryan made two starts at the start of September but had little success, earning two no decagons in Mets losses. He then made five relief appearances going 1-0 with a save. He ended the season with a 2-0 loss against the Chicago Cubs, in which he got the start & allowed just on earned run into the 6th inning. 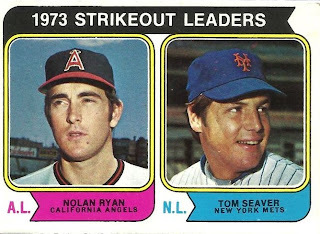 In 1970 Ryan was 7-11 with one save. He struck out 125 batters in 132 innings pitched. He walked 97, allowed ten HRs, threw eight wild pitches and hit four batters. He made 19 starts, threw five complete games and posted a pair of shut outs. That year the Mets were in the race into September but faded, finishing six games behind the Pittsburgh Pirates & one game behind the rival Cubs. 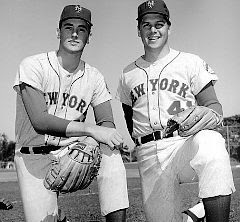 In 1971 Ryan began the year with two appearances out of the Mets bullpen. On April 23rd he finished off a game at Wrigley Field & was the winning pitcher when Ken Singleton drove home Tommie Agee in the top of the 12th inning. He closed out the bottom of the inning striking out Joe Pepitone & Paul Popovich. On April 29th he made his first start & shut out the Cardinals for six innings in St. Louis. He got the victory as the Mets scored seven runs. On May 11th he got his fourth win of the season, tossing a three hit, one run complete game against the Astros at home. On May 29th in the second game of a twin bill at San Diego, Ryan struck out a career high up to that point in his career, 16 batters. He tossed a one run four hitter that day against the Padres. At that point he was 6-1 with a 1.08 ERA & had fifty strike outs. He & Tom Seaver as well as Jerry Koosman, were making up one of the league's best pitching staffs. He then lost three straight games in June, but only gave up two runs in three of those starts. 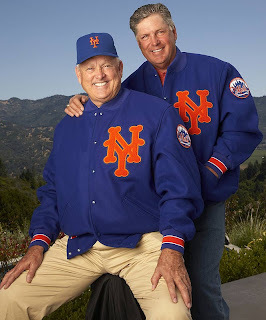 The Mets were shut out twice by the Dodgers in those games, first by Don Sutton & then by Al Downing. His ERA was still under two at 1.78 on June 15th as he had fallen to 6-4. On June 25th he pitched a complete game in Montreal to beat the Expos 4-1. He struck out ten batters but did scatter eleven hits, walking just one. Ryan then pitched seven shutout innings against the NL Champion Pirates, striking out another nine & beating ace Steve Blass. From there, Ryan had a terrible three months to end the season. He went 2-10, suffering through a five game losing streak as well as a four game losing streak in August/ September. In five of those starts he never got past the second inning. But by the same respect in five of starts over the three months (14 games) he allowed two runs or less never earning a win. On September 23rd, 1971 Ryan won his last game in a Mets uniform, it came at Wrigley Field in Chicago. That day he pitched eight innings, allowing four runs on seven hits striking out five Cubs, beating veteran pitcher Juan Pizzaro. Then on September 28th, 1971 Nolan Ryan pitched his final game as a New York Met. He never got out of the first inning, allowing three runs, a hit & four walks to the St. Louis Cardinals, taking the loss. He ended the season 10-14 with a 3.97 ERA 137 strikeouts & 116 walks in 152 innings. He pitched in his Mets career highs of 30 games & 26 starts, tossing three complete games one shut out, allowing 125 hits & a career high 15 hit batters. Leading to the Trade: By the end of the 1971season, Ryan was becoming very frustrated. Between having limited success on the mound and with his unhappiness in New York City, he told his wife he was considering actually retirement at 24 years old. Although Ryan was the hardest thrower in the league, he was not as effective as Tom Seaver, Jerry Koosman or even Gary Gentry on his own staff. Due to those facts, Manager Gil Hodges & pitching coach Rube Walker did not give him any extra time. They basically gave him the ball & told him to throw it as hard as he could. According to Ryan one of his biggest problems in New York was his six year, military obligation in the Army Reserves during the Vietnam War. He was flying back to Houston every other weekend which was certainly interfering with his pitching turns. This was part of the reason he was also being used in the bull pen. Also manager Gil Hodges refused to alter his rotation & rightfully so. 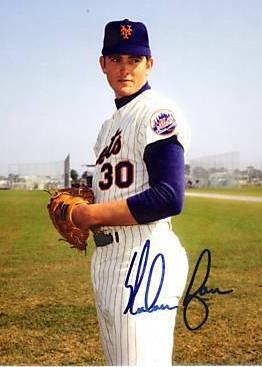 On top of all this, injuries & personal issues were more reasons why Nolan Ryan wasn't happy in New York. It was clear he wasn't going to be a Met for long. That off season he went to the Mets management & asked for a trade. By September the Mets had been out of the pennant race and the team was changing faces, since the 1969 World Series win. The Mets finished third in 1971 at 83-79, fifteen games back of the World Champion Pirates. 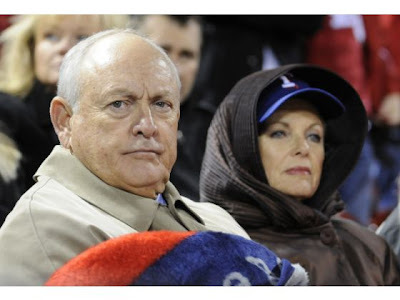 By the next season Donn Clendenon, Ron Swoboda, Art Shamsky, Ron Taylor & of course Nolan Ryan would all be gone. Tommie Agee & Gary Gentry would be in their last seasons as Mets. 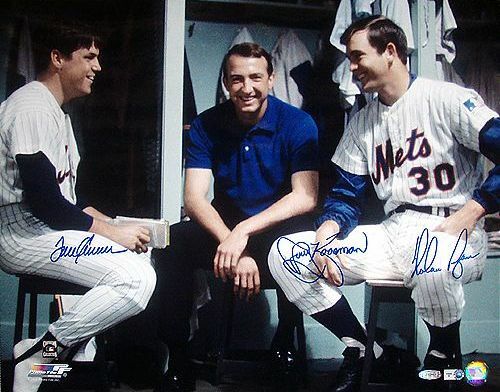 Maybe the biggest change of all would be the shocking death of manager Gil Hodges at the end of Spring Training. 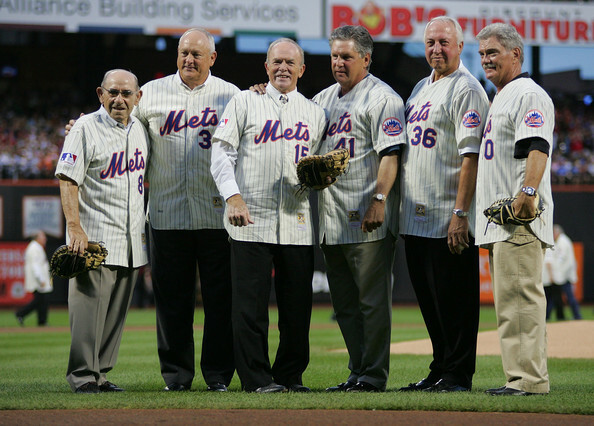 The Trade: During that off season, on December 10th, 1971, the Mets made the worst trades in their history. It was also one of the worst in baseball history even though it had to be done. Nolan Ryan was traded, along with outfielder Leory Stanton, pitcher Don Rose & catcher Frank Estrada, to the California Angels for former All Star, third baseman, Jim Fregosi. The Mets had been chasing a third baseman for much of their ten year history at that point. By that time their own Wayne Garrett should have been a good enough choice since he usually ended up with the job through 1976. 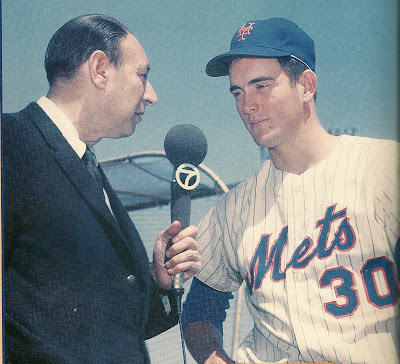 In the 1972 Fregosi season, would bat .232 with five HRs 15 doubles 32 RBIs & a .311 on base% in 101 games played for the Mets. By mid July of 1973 he would be gone altogether, after batting .234 as the Mets went on to a World Series with Wayne Garrett once again their third baseman. Nolan Ryan was going to be traded no matter what, the Mets had a strong minor league pitching staff as well, with Jon Matlack just a year away himself. But it seems the front office should have done better than Fregosi in the trade for such a stud like Ryan. It was obvious the Mets needed a power hitter, if only they had gone elsewhere fate may have been different. 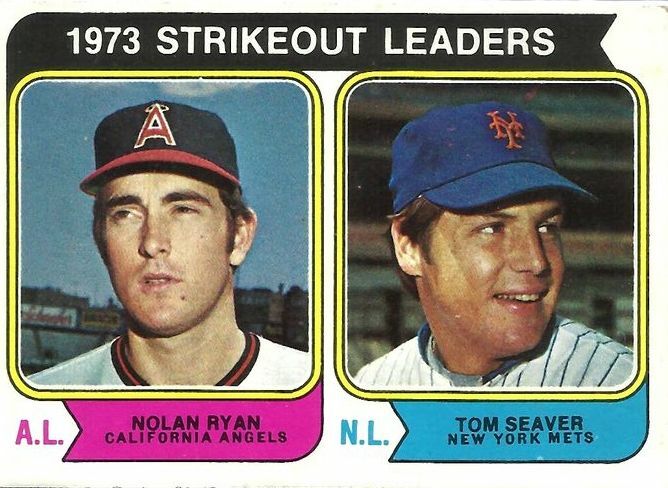 Ryan credits Tom Seaver as helping him develop into a pitcher instead of just a flame thrower. He helped by changing his high leg kick and developing an over the top delivery, using more power from the legs. Old time Mets fans with a special love in for that period in Mets history can only imagine what it would have been like to have had him on the staff through the seventies with Seaver, Koosman & Matlack as a starting four. 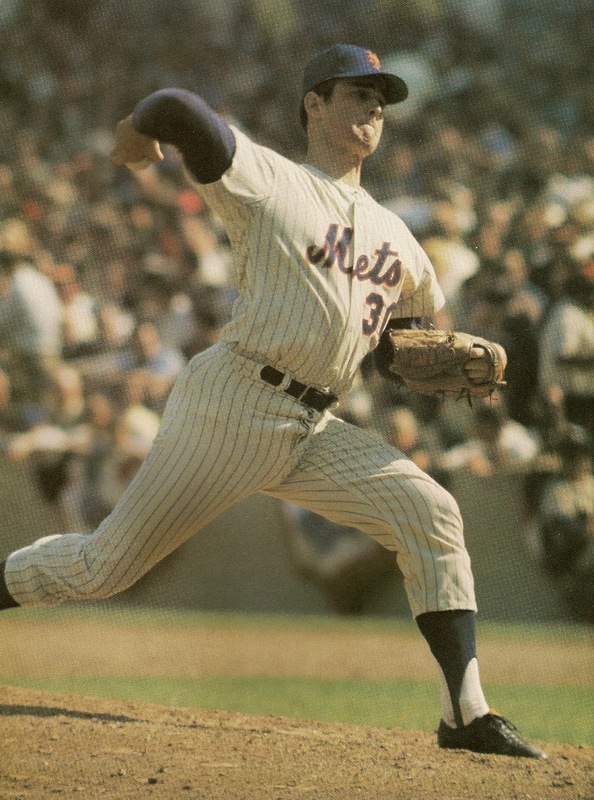 In his Mets career from 1966-1971, Ryan pitched in 105 games going 29-38 in 74 starts. He struck out 493 batters & walked 344 in 510 innings pitched. He also recorded two saves in relief. He had 13 complete games & pitched two shut outs. After New York: Nolan Ryan went on to become one of baseball greatest pitchers of all time. First he went to the California Angels and suffered, just as Seaver did in New York, on a team with no offensive support. He pitched in California for eight years (1972-1979), leading the league in strike outs seven times, all but one year. He won twenty games twice, led the league in innings pitched once, walks six times & threw four no hitters. He made one post season appearance with the Angels in 1979, losing to the Baltimore Orioles in the ALCS. In 1980 he signed with his hometown Houston Astros and pitched there for another nine years. In Houston he won two strike out titles, two ERA titles and was a 16 game winner twice. He threw two more no hitters, while getting to two more post seasons. He lost in the NLCS to the Dodgers & New York Mets in 1986. 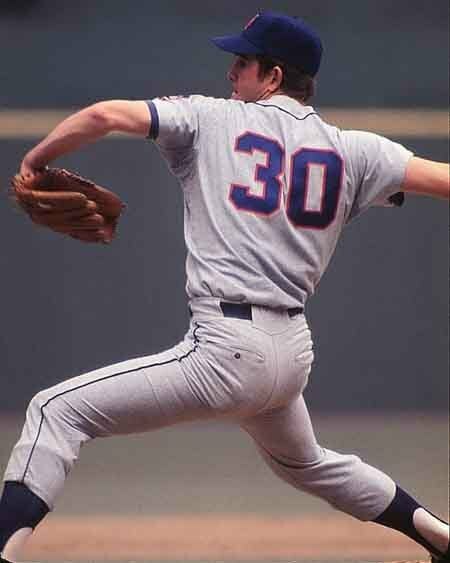 In 1989 he went across Texas & signed with the Rangers pitching there for five seasons until he was 46 years old. In Texas he won two more strike out titles, threw his seventh record setting no hitter & was a 16 game winner in 1989. He is the all time strikeout leader in major league history with 5741. He is 14th all time in wins (324) going 324-292 (3rd most losses) with a 3.19 ERA. He is first all time in walks (2795) second in starts (773) & fifth all time in innings pitched (5386). He has 222 complete games (113th all time) with 61 shut outs (7th most all time). Ryan has thrown 277 wild pitches (2nd most all time) & hit 158 batters (15th all time). He was elected to the Baseball Hall of Fame at Cooperstown in 1999, receiving 89% of the vote. 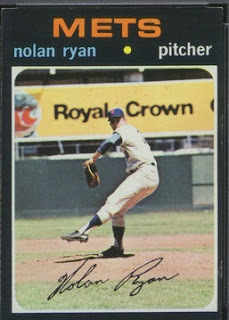 In his career he made eight All Star teams, won the 1977 TSN Pitcher of the Year Award, but never won a Cy Young Award. 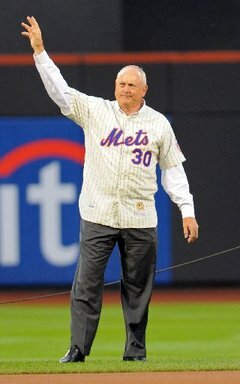 Nolan Ryan will always be part of New York Mets history. 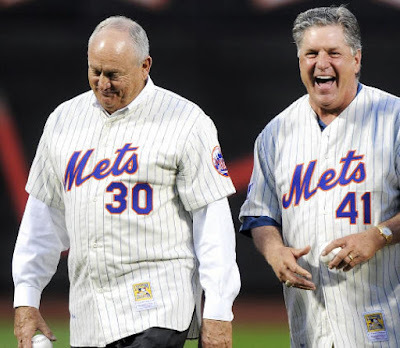 Return to the Mets: In 2009 he made his triumphant return to New York as a Met, to participate in the 40th anniversary celebrations of the 1969 Amazing Mets Championship team. He appeared at Citi Field, on television interviews, memorabilia shows & was on the cover of Sports Illustrated with his old pal Tom Seaver. He is currently the principal owner, CEO & President of the Texas Rangers. He has made them one of the most dominant teams in the past few years & got to two World Series in losing efforts. Trivia: He is the only pitcher to have struck out seven different father & son combinations. That pic of Ryan and Cosell is freakin awesome! I've never seen it before. Thank you for sharing that.